OMAHA – Tanner Andrews bid for a Big 10 baseball title fell just short Sunday. Andrews’ Purdue squad dropped a 6-4 final to No. 11 ranked Minnesota in the championship game of the Big 10 Tournament. The Boilermakers, who are 37-19, will now await word on their NCAA Tournament destination. The NCAA Selection Show is set for Monday at noon on ESPNU to announce the 64-team field. Minnesota, who also claimed the Big 10 regular-season crown, improves to 41-13. Andrews, the former three-sport star at Tippecanoe Valley High School and the ace of the Purdue pitching staff, was used in relief Sunday. The senior right-hander, who had not pitched in relief since 2016, worked the fifth inning. He allowed two hits and one run while walking two and striking out one. The Boilermakers went-toe-to-toe with the top-seeded Gophers. Purdue led 1-0 with a run in the first inning before Minnesota scored single runs in the second and third frames to take a 2-1 lead. The Boilers plated a pair of tallies in the fifth to make it 3-2 before the Gophers tied it in the home half of the fifth. Purdue answered with a run in the sixth to lead 4-3 before Minnesota scored twice in the sixth and once in the eighth for the win. Purdue, who was the No. 2 seed after going 17-6 in Big 10 play, lost 22-7 and 18-8 to the Gophers in a regular-season twinbill in West Lafayette on April 13-14. 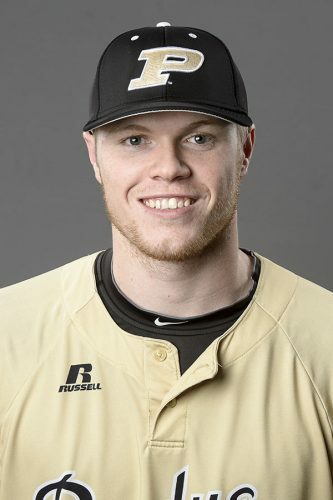 Andrews, who lead Purdue with a 7-4 pitching mark, fired a complete game gem as Purdue opened the tourney earlier in the week with an 8-2 win over Ohio State. Andrews gave up a two-run double in the first inning and then was dominant against the Buckeyes. He retired 21 of the 23 batters he faces from the second through the eighth innings and finished with seven strikeouts and 14 ground ball outs. It was the first complete game by a Purdue pitcher in the Big 10 Tournament since 2010. Andrews, a 6-3, 220-pound right-hander, was named to the All-Tournament Team following play Sunday. He earlier was a third-team All-Big Ten pick and was also the Big 10 Sportsmanship honoree for the Boilers. Purdue, which beat Ohio State (8-2), Michigan (5-4) and Illinois (11-5) to earn its spot in the finale Sunday, has had a remarkable season under second-year head coach Mark Wasikowski. The Boilers went 10-44 two years ago before Wasikowski’s arrival. Purdue finished 29-27 last year and will make the NCAA Tournament this year for just the third time in program history. The Boilers have won 21 of their last 24 games. Their 37 wins are tied for the second most in program history.